Low-profile, professional grade landscape lighting 100 Watt transformer with stainless steel housing for small to medium sized, low voltage landscape lighting systems. Low-profile transformer with easy-to-use clamp-type connectors. Patent pending. Clamp-type connections - fast, easy, and robust. ETL listed with lifetime warranty. Easy-to-set modular timer for sunset-to-sunrise operation, or for set-hours after sunset are additional options. This low-profile transformer breaks ground in simplicity of installation and control. The clamp-type terminal blocks are impressively easy to use - taking seconds to connect - compared to the time for standard terminal blocks. Just insert the stripped wire and close the clamp! Additionally available (sold separately) is the AMP® newly designed timer/photocell combination. When installed, it is visible through the housing window and can be set for simple dusk-to-dawn operation, or set to turn off after a certain number of hours. Photocell sensitivity may limit transformer placement. This timer is a removable module - easily replaced. The Slim Line Transformers have an easily removable, tool-less grommet to replace the metal knock-outs of traditional transformers. Traditional knock-outs required tools and were difficult to remove. The grommets on the new Slim Line Transformers are removed easily and can be replaced if necessary. To make the transformer slimmer, lighter, and simpler-to-install, we eliminated unnecessary voltage taps. Instead, the single 15V tap replaces having to choose among 12V, 13V, and 14V. 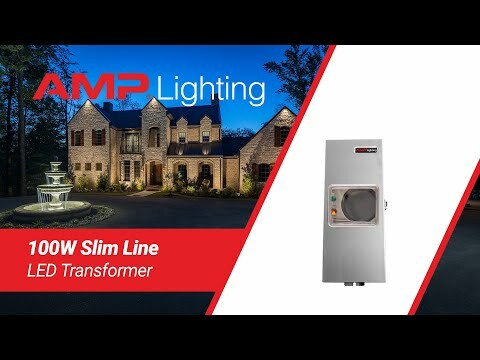 The Slim Line Transformer is all you need for any small to medium sized (up to 100W) AMP® LED system with no voltage loss. Toroidal core for reliable, efficient, cooler and quieter operation. Clamp-connects for easy, fast, and secure connections. Takes up to 12-gauge wire. Designed for AMP ®LED fixtures and systems.